Some weeks ago I describe a green celluloid Pilot pen. The main argument of the text was about the uncertain manufacturing date given the mixed information the pen provided. The green celluloid pen described some weeks ago. I described the pen as an eyedropper with shut-off valve, and that was not only wrong, but it made no sense given the structure of the valve. That filling system, let us remember, had the special feature of a sliding sheath with a cone-shape ending. But if the valve could slide along the axis, unscrewing the tail knob would not do much in order to open the access to the section. 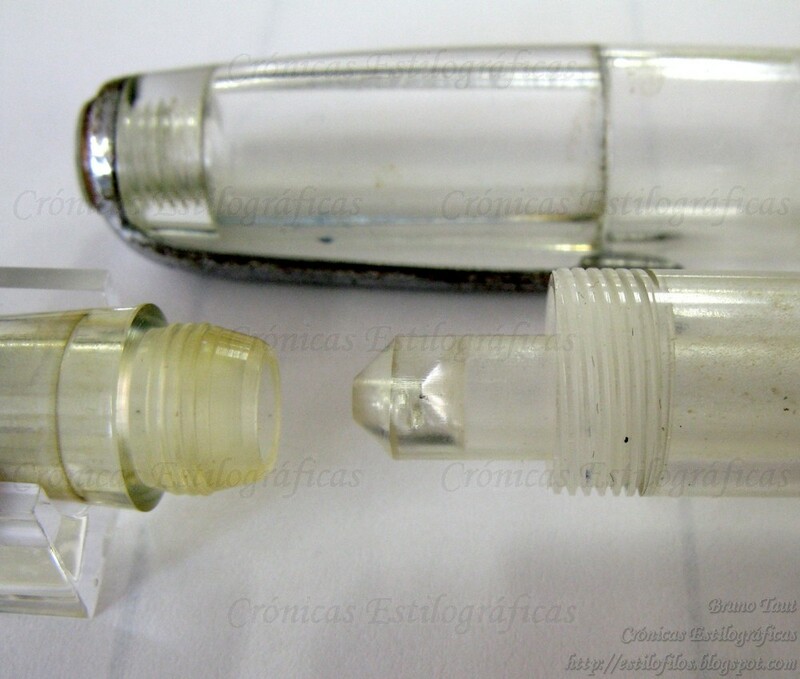 The clip has the same design as that on the green celluloid pen. A demonstrator Pilot from late 1940s with the A-shiki filling system. Note the sliding sheath on the picture on bottom. 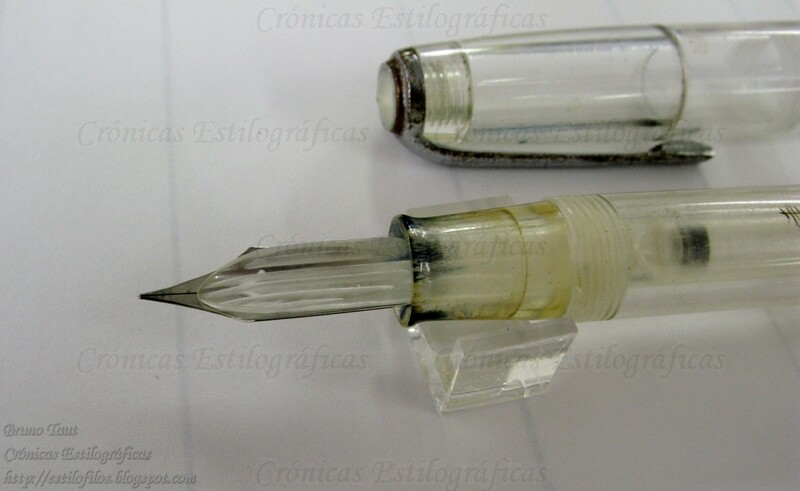 In fact, that was not an eyedropper pen, and the filling system is a sort of “pulsating plunger filler”. It is a plunger filler that needs to be operated repeatedly –three or four times— to fill the ink deposit. The sliding sheath provides an incomplete seal to prevent the ink from flowing out of the deposit on the down strokes of the system. Its efficiency relies on the tight fit between the axis and its seal on the barrel end. The section, left, and the sealing sheath, right, in detail. This system is called A-shiki (A-式), and was implemented by Pilot in the late 1940s. 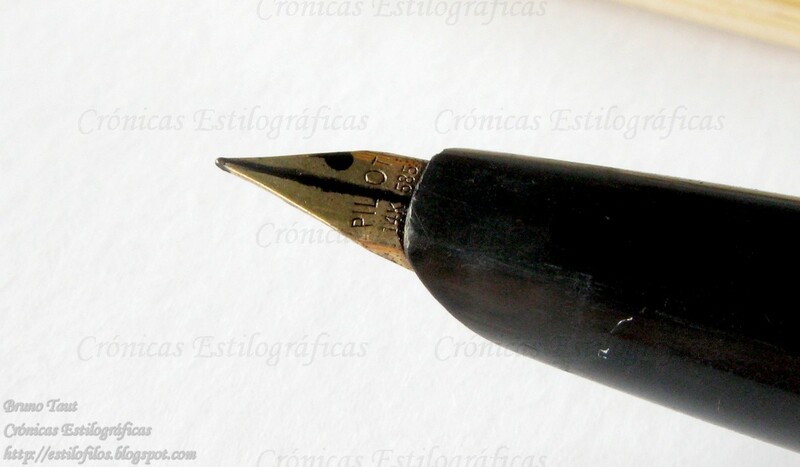 This shows that the green celluloid pen was not a frankenpen but a true product of its time—1950. 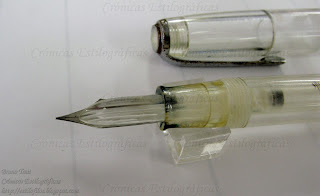 The pen illustrating this chronicle is a beautiful example of a demonstrator pen with this A-shiki filling system. Even the feed is transparent on this demonstrator. My thanks to Mr. Niikura. Thank you for the info on the A-shiki filling system and for letting me link back. Good on you!